from Lamido I bought it only for freaking RM 23. Huge difference right ? The quality have huge difference too. I am regretting now. I should have just bought the original. 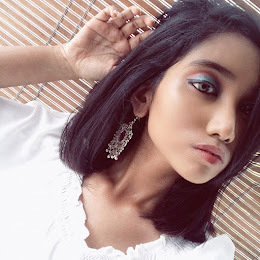 Guys, next if you want to buy makeup from any website, try to buy from the original website like M.A.C or Sephora from Zalora.com.my or Luxola.com.my. If you want to buy, make sure you google some reviews about the product you want to buy and consider whether you buy to buy or not. It's not the money, make sure the quality satisfy you. I found that this palette is counterfeit after I googled and saw some Youtube videos. The real Naked 2 palette come with lip gloss not in black cardboard box written Naked 2 on it. The real packaging is transparent and come with a pink lip gloss. But be aware that nowadays the counterfeit one also comes with the same pink lip gloss. It is always better buy expensive makeups straight away from the store or from official website. As can you see the picture above, the mirror is a total useless because it appear like a chincy, fun-house mirror, wobbly and unclear. However, the original mirror is much steady and clear to apply the eyeshadow. 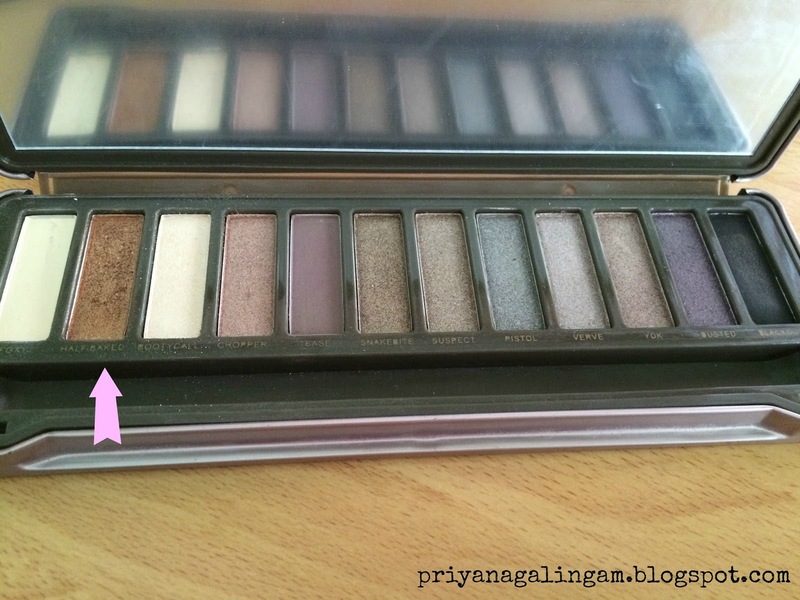 These are the colours in the fake Urban Decay's Naked 2 palette. The arrow above showing my favourite shade in this whole fake palette. I found out this shade is nice although this is from fake palette. 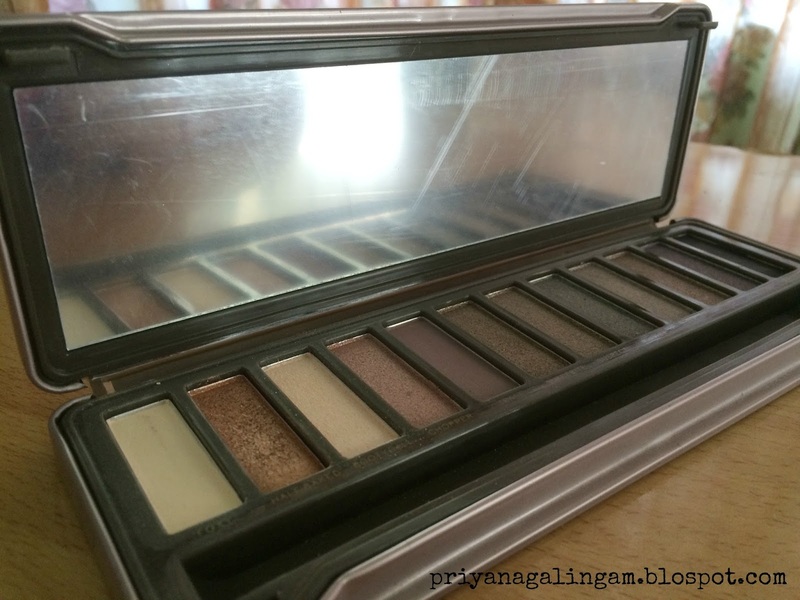 Overall, some of the colours have bad pigmentation and some of the colours are okay. I found out the matte colours are slightly chalky. 1. Foxy - Foxy is a great highlight colour for your brow bone. However, the colour is chalky and leave patchy. 2. Half- Baked - This colour is nice in my opinion despite it is from fake palette. Nice pay off. 3. Bootycall - This colour is very similar to Foxy but the only difference is this one has gold shimmery dust in it. This colour has bad pigmentation after blend it. It become almost invisible after blend. 4. Chopper - It is a rose gold colour. Surprisingly, this colour has a great pay off too like Half- Baked. 5. Tease - This is the worst colour among all the other colours. This is actually a beautiful transition colour, however, in this counterfeit palette, the colour is almost translucent which really make no sense as an eyeshadow. 6. Snakebite - Bronze colour with gold shimmery dust. It is a beautiful colour and have a great pay off too. 7. Suspect - Is almost same as Chopper but the only difference is Suspect has lighter shade off pink in the colour compare to Chopper where the pink is more intense. 8. Pistol - It is a greyish with slight hint of deeper purple to it with silver shimmery dust in it. It has a good pigmentation too. 9. Verve - Very similar too Pistol shade. Differ in the colour where in Verve is has more brighter purple than deepar in Pistol. Other are just the same. Pigmentation is just nice. 10. YDK - I don't know what stand YDK for but the colour has more hint of purple than Verve with silver shimmery dust to it. It's pigmentation is good too. 11. 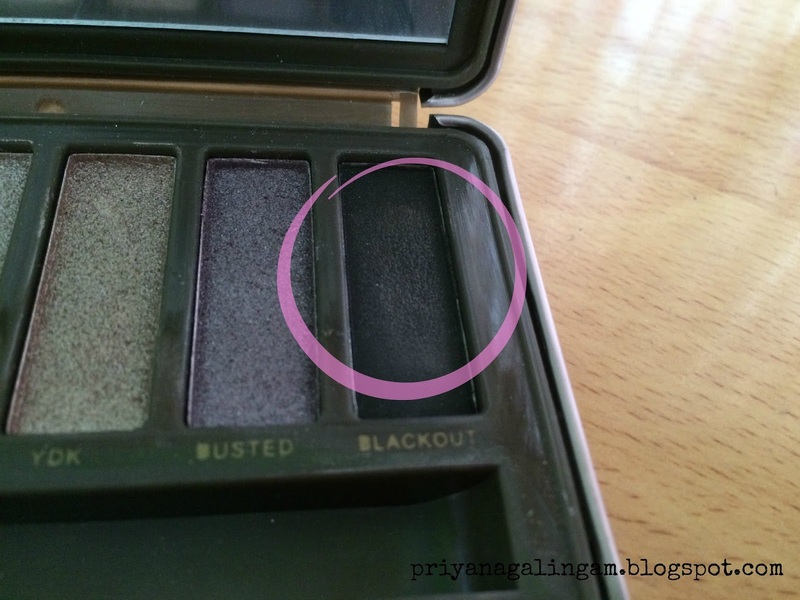 Busted - Busted is purple shade with silver shimmery dust in it. It is a beautiful shade and have a great colour pay off too. 12. Blackout - Most of people said that Blackout has better colour payoff in fake one compare to ori. However, in my palette is has very bad pigmentation. It is almost nothing and very chalky. When I swatch blackout shade, it creates white cast on the shadow. When I rub on it again I doesn't come off. 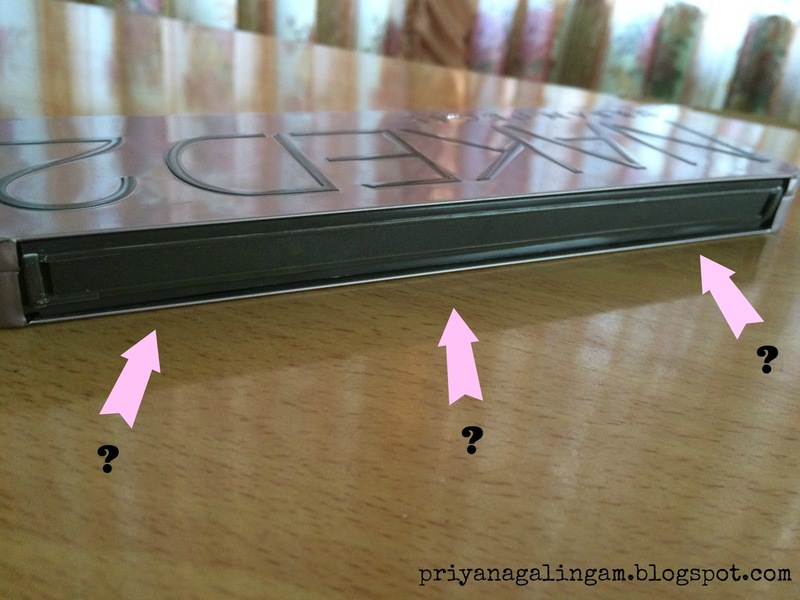 Actually there is a strip of aluminium sticked behind the palette written Urban Decay. However, after some time, it came off. I tried to stick back on but I refuse to stick. So, now it is really naked behind the Naked 2 palette.